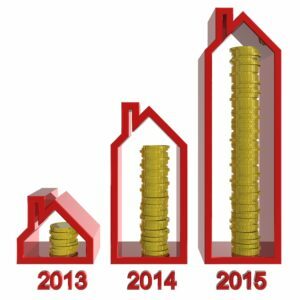 Home Price Increases: Are They Sustainable? One of the best indicators of the sustainability of home prices is the ratio between income and home prices. If home prices rise faster and higher than homebuyers’ incomes, potential homebuyers can’t afford as much, which puts pressure on sellers to lower their price point. That is a big difference between a 40% increase in home prices and only a 12% increase in incomes! Is a plateau in our future? Markets such as San Francisco have had home price increases of 98% and are only 7% off their all-time high in 2006. In Las Vegas, homes are 72% higher than the low but are still 34% off the all-time high. However, home prices are very localized. This is true even within a large city like Las Vegas. If you own property in Las Vegas, you may have noticed that property values in Henderson, just south of Las Vegas, have increased significantly and remain strong, while property values in North Las Vegas have generally not seen as high of an increase. Home prices can vary widely within miles, blocks, or even streets in a municipality. One of our operators was recently in Detroit checking on some homes that we own. Even within the notably bad areas, our operator found that the neighborhood demographics changed from block-to-block. Just as we can’t generalize home prices across the nation, we also can’t determine that incomes should be the same in all US cities. Where you live is determined by what you can afford, but you can choose where you work. For many people, this means commuting from a home they can afford to a job that pays an appropriate income. Even people doing the same type of job in different cities will make different incomes based on the cost of living in their location. This is essentially why I have a huge problem with the state and federal government (especially the feds) dictating the minimum wage. Not only is it artificial and has no bearing on the actual job market, but whatever number is chosen will be completely illegitimate in certain neighborhoods. I am not a supporter of the minimum wage law, but since we have one, it should at least be tied to an index of some type — possibly a housing index — within a city. The states and the country as a whole are too large of a market to make it universal. Let’s talk about Reno for a moment. Home prices continue to rise with a limited number of available homes under $300,000. There are only about two months of inventory on the market. (Six months is considered normal, so two months is a seller’s market.) How did this happen? Three main factors have caused this housing crunch. First, during the housing crisis, Reno was hit really hard. Some properties lost 50% to 70% of their value from their peak. When that happened, home builders stopped building. Second, we are fortunate to have some very smart developers and visionaries in Storey county who have attracted some very large businesses. This is where the largest industrial park in the world houses Tesla’s Gigafactory, Switch, eBay, a gigantic Walmart distribution warehouse, and now Google. Lastly, these two factors combined have caused the City of Reno’s building permit department to bottleneck on issuing new permits to build homes for the thousands of new people moving to town. All of this is localized, so it will only affect Reno’s home prices and income. We don’t know where it is headed, but it appears positive. We can only hope that income will keep up with rising home prices.